Known for its beautiful beaches, Tenerife attracts thousands of tourists annually who flock to the islands shores to enjoy the year round good weather. The trademark black sand natural beaches created by the islands past volcanic activity have left a few beautiful natural beaches, however the sharp increase in the volume of year round tourism has required the development of new man made beaches to accommodate everyone. Those looking for a clean and well maintained beach should head to Jardin. Local authorities have redeveloped the beach front using reclaimed local sand in the area surrounding Punta Brava, and it offers a pleasant swimming and sun bathing experience and also boasts a number of facilities. Another popular beach area is Martianez Pond which has also been redeveloped extensively. Made from water from the sea, this creation of a large pond by local born Canaries artist Manrique has remained true to local style and incorporated vegetation and aesthetic elements to ensure a pleasant experience for the user. The large sea water pond is accompanied by other swimming areas which are popular amongst young and old alike. 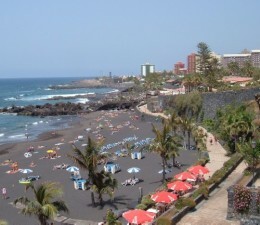 Nearby is a natural beach at Martianez with has at some parts the trademark black sands for which the area is famous. The waters are choppy here and lend themselves well to water sports. Heading north, you will find another beach which has had a bit of help from the local authorities - Teresitas. Imported sand had widened the beach in the 70's and some lovely trees and vegetation has been planted. The area is filled with charming local eateries specialising in local seafood. A more rugged beach is found at Roque, which also has a number of restaurants in the area. It is popular amongst those wanting to try surfing and other water sports but its rugged nature can sometimes lead to unsafe tides, so care is needed here. It also boasts the trademark sands of the area. Those wanting to practise free nudism will find a few suitable places, for example at El Medano beach, which is also famous for its windsurfing championships and windy seas. Puerto de Santiago beach will offer the user no sands, but large rocks offer great sun bathing possibilities and the waters of its small cove are excellent for snorkelling and scuba diving. Therefore, in Tenerife, you'll find a wide array of beaches suitable for all tastes - sports fans, young families and adults alike. villa costa blanca is ready for a season full of sun, sea, beach party for you. Club Villamar let your ideal vacation dream come true with a varied selection of holiday homes in club villamar and vakantiehuis spanje.